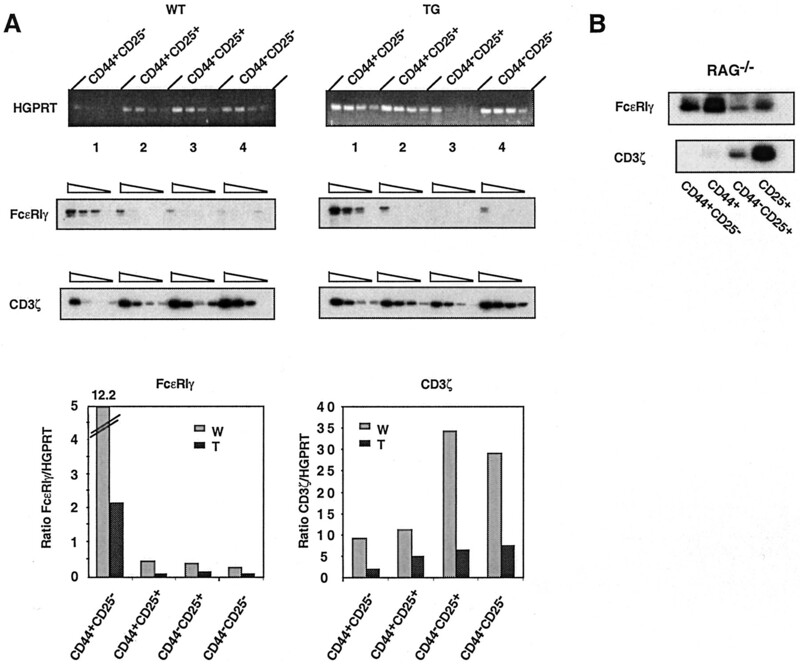 The TCRα transgene induces early αβ TCR expression. 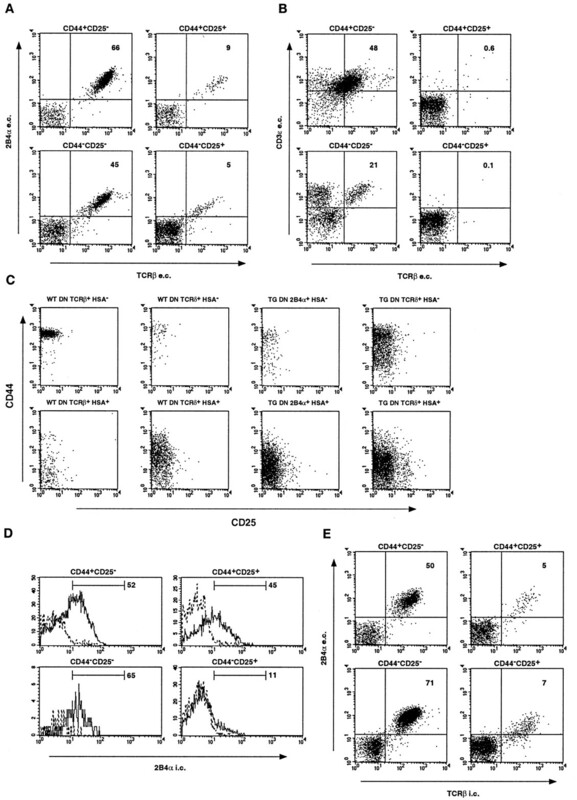 Thymocytes from TCRα-chain TG mice (A) or C57BL/6 mice (B) were depleted of CD4- and CD8-expressing cells and stained with 2B4α (CD3ε in B), TCRβ, CD44, and CD25 Abs as indicated and analyzed by flow cytometry. C, DN TCRα-TG and C57BL/6 thymocytes (WT) were prepared as in A and stained with 2B4α (TG), TCRβ (WT), CD44, CD25, and CD24 (HSA) Abs. CD24-positive (HSA+) and CD24-negative (HSA−) cells were gated and analyzed separately. D, DN TCRα-TG (solid lines) and C57BL/6 thymocytes (dashed lines) prepared as in A were stained with TCRβ, TCRδ (both PE-labeled), anti-CD25, and anti-CD44 Abs on the membrane and intracellularly with 2B4α-chain-specific Abs. TN cells were then gated and analyzed. E, TG DN cells prepared as in A were stained with 2B4α, CD44, and CD25 Abs on the membrane and intracellularly with TCRβ Abs. The numbers indicate the percentage of total, DN, and TN thymocytes, respectively. TG DNαβ T cells are generated at several developmental stages. Purified TN TCRα-TG CD44+CD25+ thymocytes (1 × 104 cells) were seeded into irradiated d14 fetal thymic lobes from C57BL/6 mice. A, Expression of CD25 and CD44 molecules by DN TG TCRα+ cells was analyzed by flow cytometry at indicated days of culture. B, Day 14 fetal TCRα-TG thymus lobes were analyzed immediately or cultured in vitro for the indicated days. The fraction of TG TCRα+ cells was determined in the indicated populations as in A.
FcεRIγ and CD3ζ genes are reciprocally expressed in adult TN thymus subpopulations. A, RT-PCR analysis was performed using RNA from sorted TN thymocyte subpopulations from C57BL/6 and TCRα-TG mice. cDNAs were amplified with HGPRT-, FcεRIγ-, and CD3ζ-specific primers, as indicated. The FcεRIγ- and CD3ζ-specific products were blotted to filters and hybridized with oligonucleotide probes. The diagrams show the ratios between the signal obtained by phosphorimager analysis and the HGPRT signal quantitated from ethidium bromide-stained gels. The difference in ratios between cDNAs from normal and TG mice is due to the differential ethidium bromide signal in different agarose gels. B, RT-PCR analysis of cDNAs from various precursor populations sorted from RAG-deficient (RAG−/−) thymocytes. cDNAs were equalized using HGPRT-specific primers. TG DN αβ T cells can use an unconventional TCR/CD3 complex. A, B cell-depleted DN TCRα-TG spleen cells were analyzed by flow cytometry. The histograms show the fraction of DN 2B4α+ and TCRδ+ cells expressing FcγRII/RIII. B, cDNAs from sorted TG DN αβ T cells, γδ T cells, and NK T cells from normal C57BL/6 thymus were equalized using HGPRT-specific primers. Equalized cDNAs were amplified with FcεRIγ- and CD3ζ-specific primers, blotted to filters, and hybridized with oligonucleotide probes. Lysates from FcεRIγ mRNA+ T cell hybridomas (clones K15 and K23) were precipitated either with anti-TG TCRα (C, lanes 1 and 2) or anti-CD3ε (C, lanes 3 and 4) Abs and separated on a 10% Tricine SDS-PAGE gel. Immunoblots were performed with either anti-CD3ζ or anti-FcεRIγ Abs (lanes 1 + 2 and 3 + 4, respectively). D, Lysates from a control FcεRIγ mRNA− T cell hybridoma K1 was precipitated and blotted in the same way as in C. The blot was overexposed to confirm the absence of the FcεRIγ protein. E, Anti-CD3ε (lane 1) and anti-FcγRII/III (2.4G2) (lane 2) immunoprecipitates of a lysate from the WEHI 3 macrophage cell line were immunoblotted with FcεRIγ Abs to demonstrate the specificity of the detection system. The FcεRIγ (10 kDa) and CD3ζ proteins (14 kDa) and dimers thereof are indicated. Early thymocytes can use an unconventional TCR/CD3 complex. A, DN transgenic thymocytes were stained with biotinylated anti-TG TCRα-Abs and PE-streptavidin. 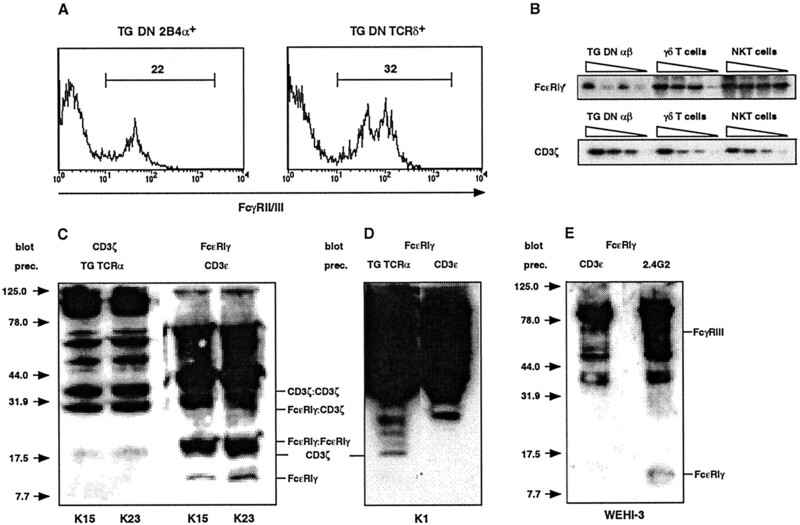 The cells were incubated on ice (A) or for 15 min at 37°C to induce capping of the TCR (B and C) then fixed and labeled intracellularly with anti-FcεRIγ (A and B) or control rabbit Abs (C). These were detected by FITC-labeled anti-rabbit Ig antiserum (see Results for details). The cells were then analyzed by confocal microscopy. 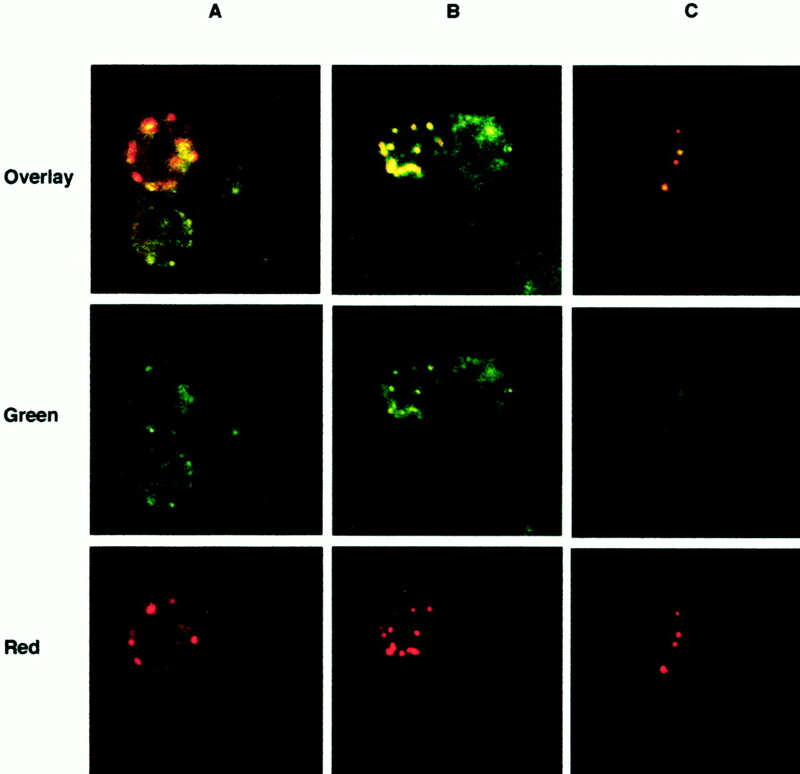 Top, Overlay of images obtained of the green (FITC, middle row) and red (PE, bottom row) fluorescences.